Welcome to the End of the World! Or maybe it's the beginning? We're still fighting over that point. In fact, there's a lot of fighting now that two worlds have collided. It can be a bit confusing. Luckily I am here to help you out, with notes on everything you need to know about the Fall of Man. Learn about the powers of Arcane Focus, Faith Focus, Mutation Focus, and Technology Focus, and how well they don't play together. Gain insights into the canites, energivores, hanites, and reborn, new races all fighting for their places in what's left of the worlds. 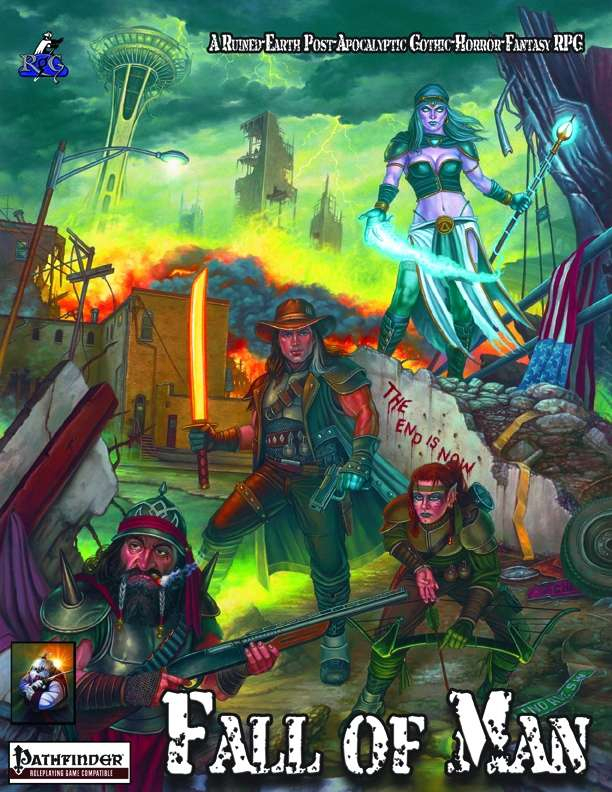 Plus gear, monsters, npcs, new skills, and all the details you need to run a Pathfinder-compatible post-apocalypse campaign with a twist. Where are the Technomancer and Technomaster feats referenced on page 62 under the Technological bloodline? I can't find them in this book or the PRD. On page 11 there is mention of how locations have Foci values yet there is nothing in the campaigns chapter of what they may be for anywhere in the setting. Is this to be used in future supplements? Technomancer should be Fledgling Technomancer. The name was changed when we decided to do something else with the technomancer later as its own thing. Technomaster requires fledgling technomancer and allows you to increase the technomancy spells at +1 spellcaster level (max 20) for each point you have in Technology Focus above 10. Usually, technomancy spells have a set caster level of twice their spell level. We'll add it as an option in an upcoming adventure/book, but for now you can use that if you like. Otherwise, there are plenty of other feats to use. Locations can have a strong focus of their own (think holy ground around a church). In the Focus chapter, it says that creatures with an opposed focus lower than the rating in an area have difficulty accessing their abilities and spells (if arcane or faith) and can even fail to use them when a natural 1 is rolled (even if they usually wouldn't). We will be adding locations with focus ratings when we start putting together adventures....See more For now, some of the obvious ones include a power plant with a tech or mutation rating, a church with a faith rating dedicated to the one god or a grove with a faith rating dedicated to the many gods. As for Arcane focus rating areas, maybe there are some around where a lot of magic is used, such as an arcanist's home or the sites where the rifts merged Gothos with Earth. Okay, thank you for the quick answers. Can't wait to see what is coming next! Especially how you are going to include the dream/nightmare element into the setting.